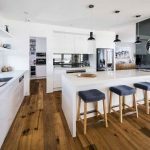 He created a remarkable home for himself by combining two of the units. 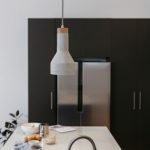 He knew that he would require assistance when it came to renovating the kitchen, so he called SpaceCraft Joinery for our expertise and objectivity. 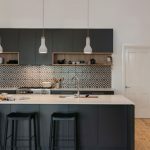 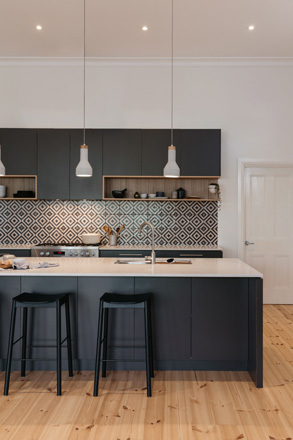 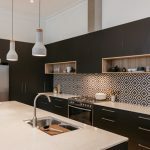 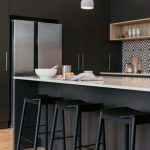 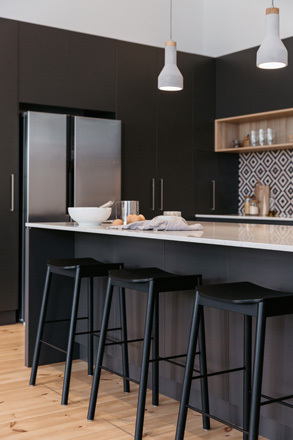 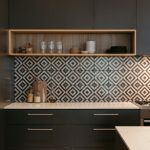 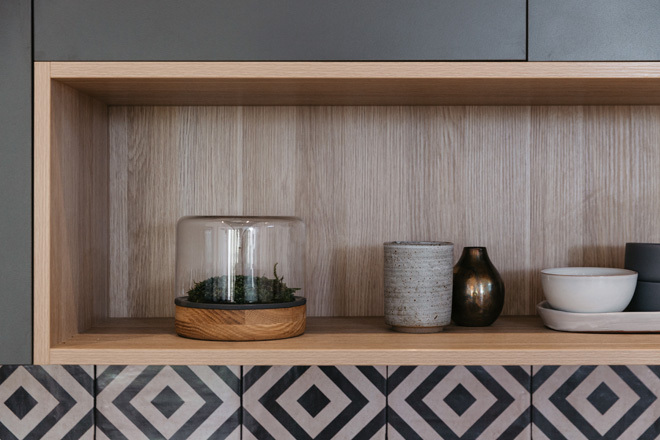 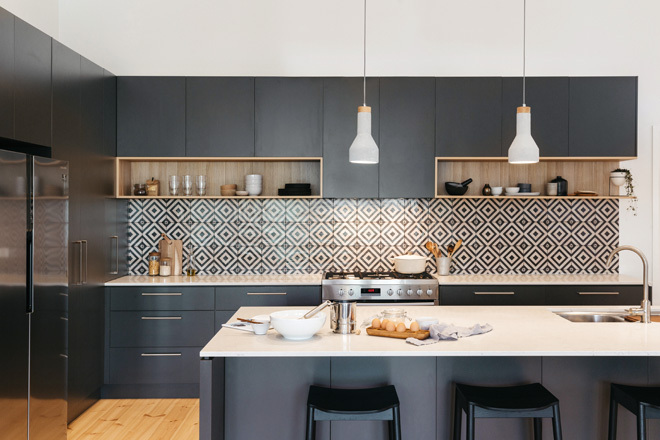 The homeowners’ brief was to create a large contemporary-style open plan kitchen with a warm colour palette, textural tiling and open shelving. 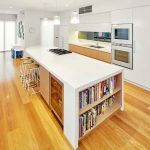 They wanted a large island bench to act as the central hub for entertaining and big family gatherings, with lots of drawers and storage space. 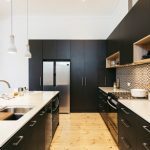 Unfortunately, the space they had chosen for the kitchen faced into the home. 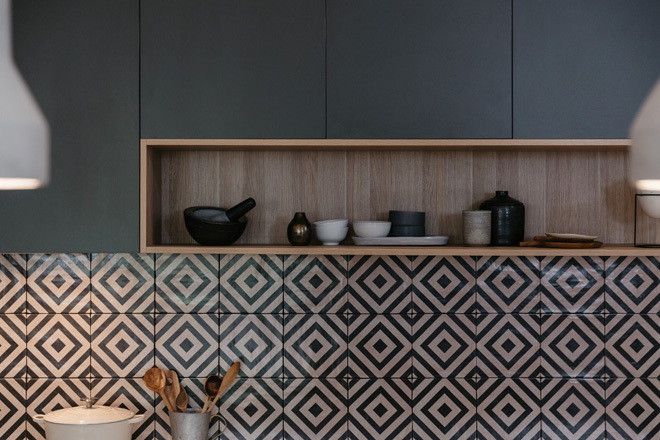 Being close to an external doorway, it severely restricted the layout and available space, and a ect the ease of traffic flow as well. 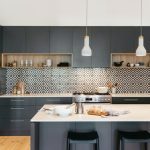 We suggested moving the kitchen to an entirely different wall, giving the homeowners more space to play with and allowing the proposed kitchen to overlook the backyard, the soon-to- be-built deck and pergola. 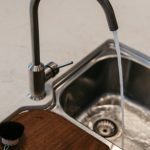 Though this required re-routing the plumbing and other services, the homeowners were up for the challenge. 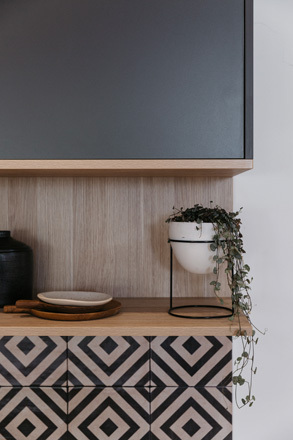 The final design included L-shaped joinery along two walls fronted by a generously wide island bench. 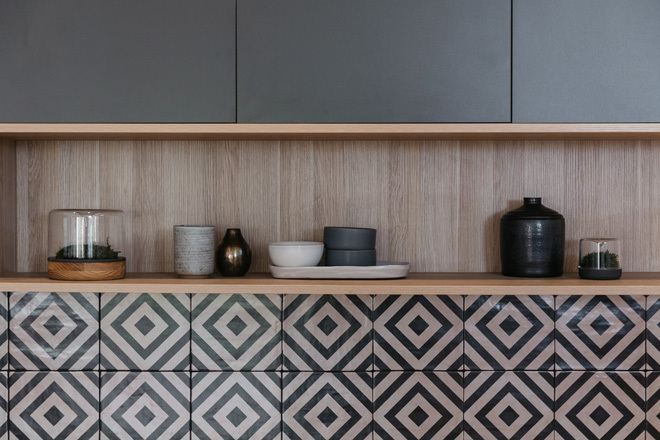 Along the front of the bench is a row of almost-invisible, push-to-open doors that provide access to copious storage. 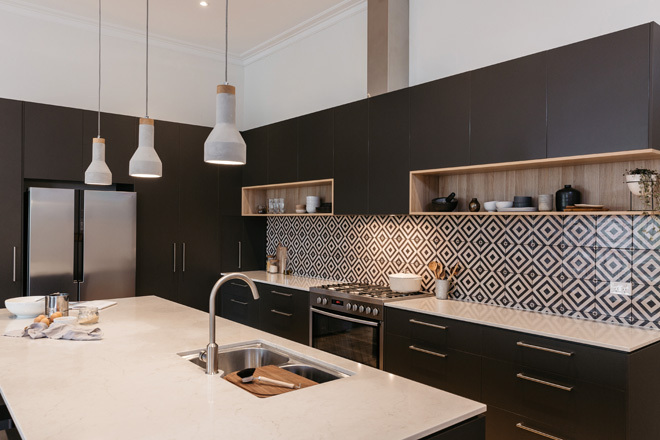 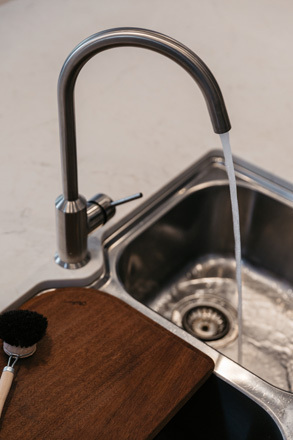 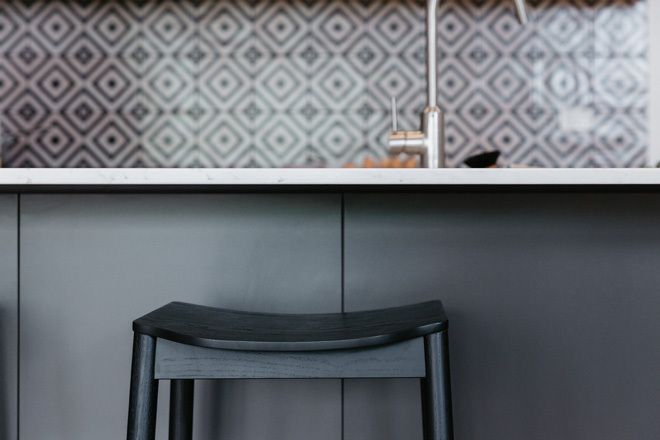 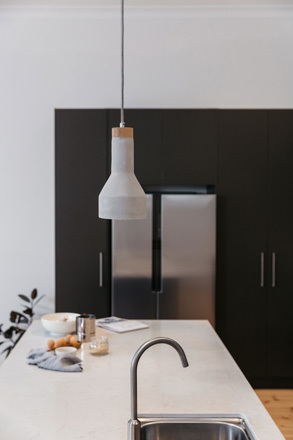 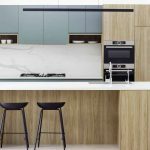 This layout creates an ergonomic, user-friendly working triangle with the sink, pull-out bin and oven all within effortless reach of one another. 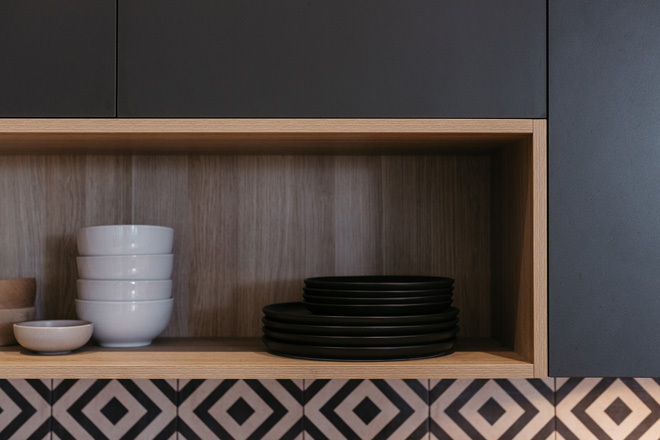 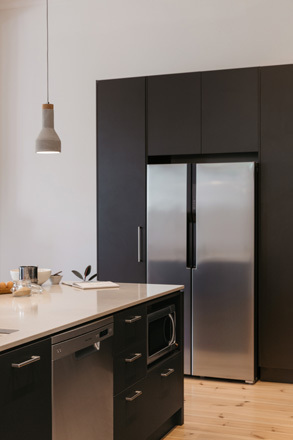 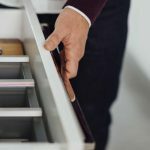 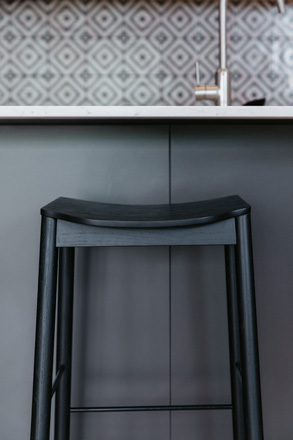 The svelte overhead cupboards also have discreet push- to-open doors without handles. 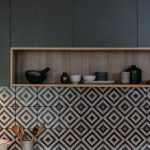 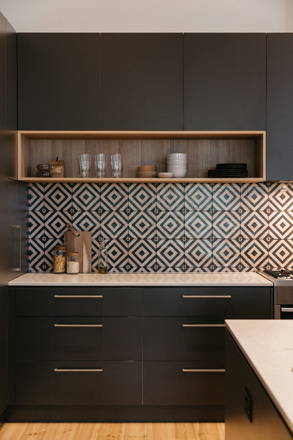 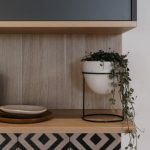 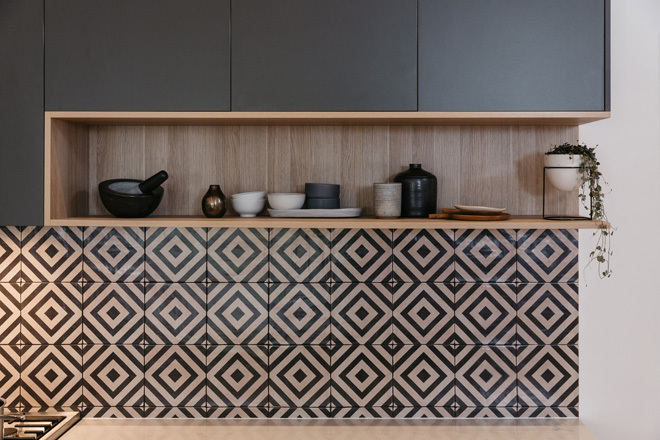 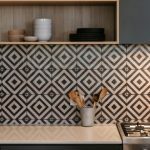 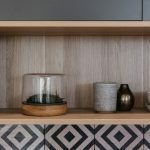 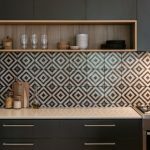 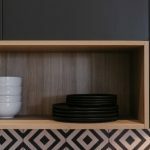 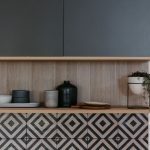 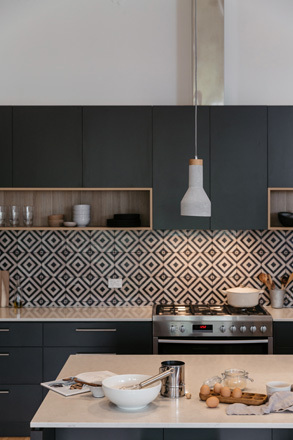 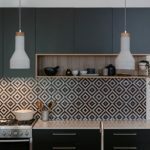 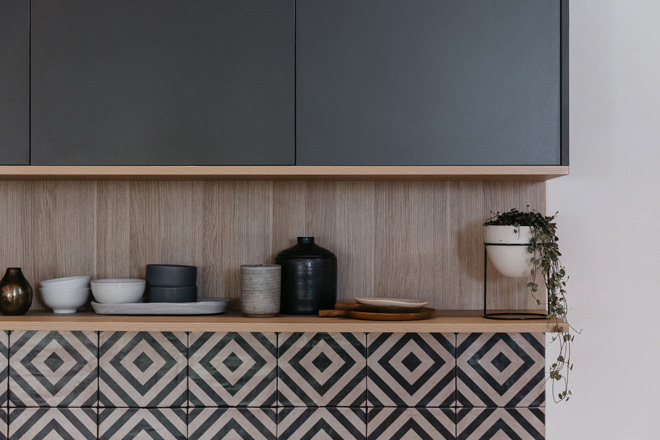 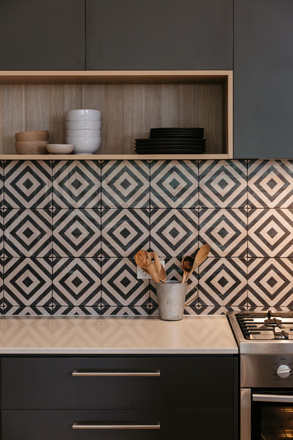 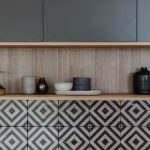 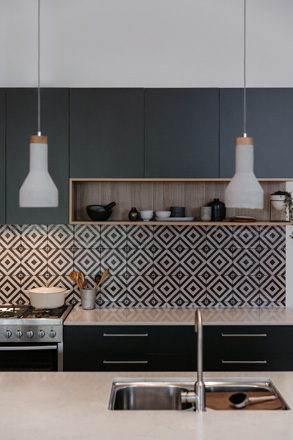 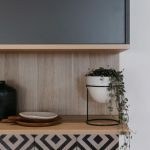 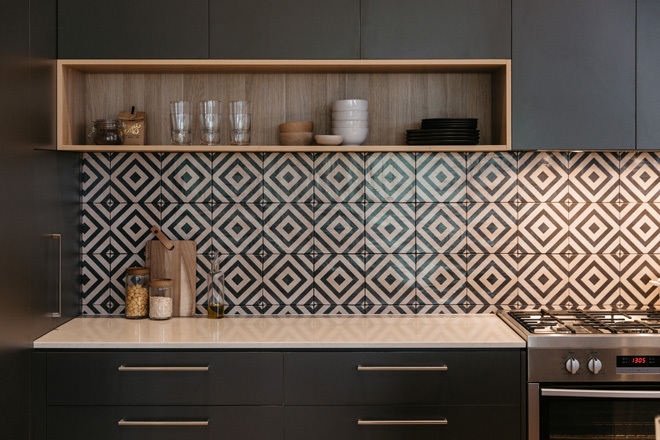 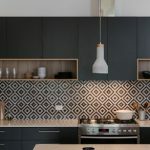 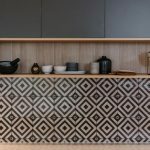 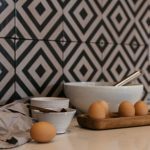 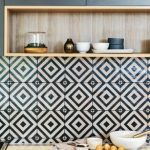 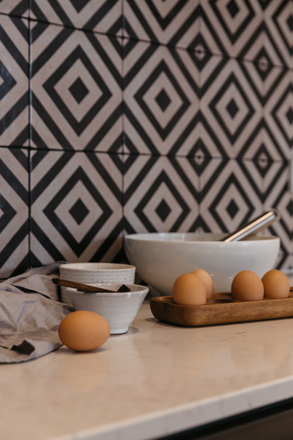 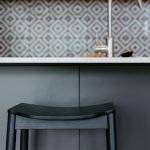 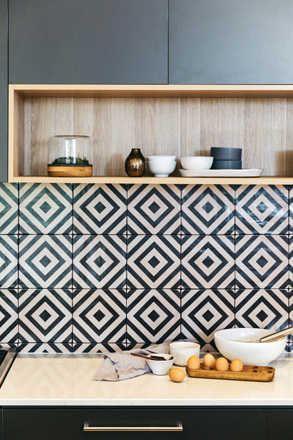 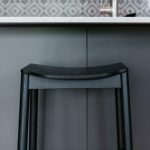 The timber of the open shelving offers a pleasing contrast, and the funky tiles chosen by the homeowners add delightful texture and interest to an otherwise clean, simple palette. 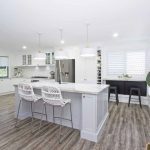 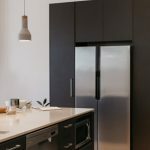 Thoughtfully, there are places to hide all the appliances — the microwave has a cubby-hole under the island bench and on the return wall, there’s a nook to store everyday appliances like the toaster and kettle. 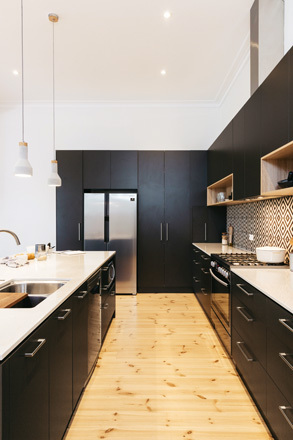 There is also a cavernous pantry. 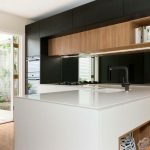 Overall, this new space is a smart, timeless kitchen with a beautifully soothing feel that integrates with the living area. 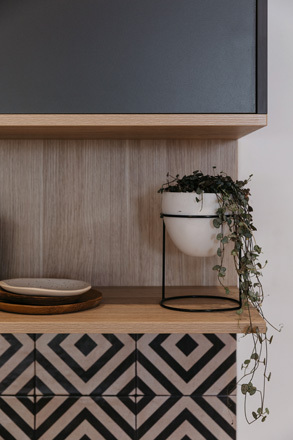 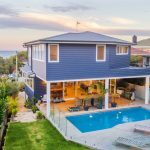 It’s warm, cosseting and welcoming, just perfect for a family home.